The Guyana Motor Racing & Sports Club last Thursday evening named a strong team to represent Guyana at tomorrow’s Seaboard Marine Caribbean Motor Racing Championship scheduled for the South Dakota Circuit. According to information received, Guyana will be represented in the Group 4, 2 and Superbike categories. In the Group 4 Division, those selected are: Irfaan Kalamadeen, Andrew King Kevin Jeffrey, Kristian Jeffrey, Rupie Shewjattan, Vishok Persaud, Danny Persaud and Mark Vieira. The Group 2 category contains Chet Singh, Raj Singh, Keeron Rodrigues, John Joseph, Damien Singh, Andre Dhanraj, Shairaz Roshandin and Shawn Seejattan, while the Superbike representatives will be Nikhil Seereeram, Stephen Vieira, Joel Nebett, Nicholas Boodhram, Carlos Rodrigues, Matthew Vieira, Kevin Persaud and Maurice Menezes. 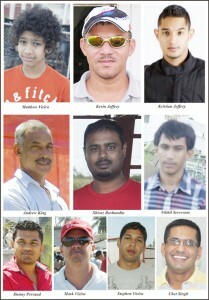 Here is a look at who is who on the Guyana team. This is a young rider who has come on leaps and bounds in a short space of time. His father Mark is one of the best drivers in the Caribbean so racing is in his veins. Much is expected of him at this Meet. This wily veteran is now being overshadowed by his son Kristian, but is still expected to feature on Sunday. He is being hailed as the new king of the division in the Caribbean. However with the arrival of Jamaica’s David Summerbell Jnr. widely regarded as the best in the Region, Kristian will have to be at his lethal best to take the reins of power. There is no substitute for his experience. Andrew is definitely one of the greatest and most durable drivers in Guyana and the Caribbean. His skill and ability is second to none and while the opposition as improved machine, Andrew keeps in contact through sheer talent and will. This young rider is already being touted as the heir apparent to Stephen Vieira and clearly underlined that billing after posting victories against him in recent times. It will be an interesting showdown when the two clash tomorrow and fans will be in for a real treat. He is a champion and come tomorrow all contenders will have to drive out of their skins to defeat him. He is undoubtedly the best to come along since the likes of Frank Van Sertima, Johnny Thijs and Kevin Jeffrey and has represented Guyana with distinction over the years. Still considered the best, Vieira must however stamp his authority at this CMRC to effectively shut down the conversation about the upcoming members of the young brigade such as Seereeram and Matthew Vieira. What more could be said about this fierce competitor who has won the hearts of the Caribbean over and over for his skill and without doubt his daredevilry. Vieira has thrilled fans in very country that has hosted the CMRC and is set to do tomorrow against some of the best drivers in the Region. Chet is known for being a perfectionist meaning he is very meticulous about the car’s preparations for optimum performance. While this Meet will be a challenging one for him his team is confident that he will produce a good showing. This little giant among big men has already shown his class and courage against the very best and his second place position in the points standing sets him up nicely to be in the reckoning at the end of the day. Photos on server Claude as: Matthew Vieira, Kevin Jeffrey, Kristian Jeffrey, Andrew King, Shairaz Roshandin, Nikhil Seereeram 1, Chet Singh, Stephen Vieira, Mark Vieira and Danny Persaud 1.